Now that we’ve reviewed S.M.A.R.T. 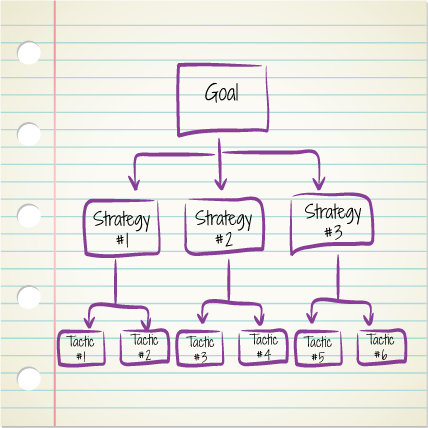 goals, let’s look at how goals, strategies, and tactics differ—and work together. A goal indicates what you want to achieve, strategies show how you will achieve the goal, and tactics are the specific actions you take to execute a strategy. Think of it visually like a tree structure (see the image on this post). Start with one goal, support that goal with strategies, and then support each of those strategies with tactics. Goal: Get 2 new clients for [your program name here] this month. Any thoughts or questions? I’d love to see what you work up — try one goal, one strategy, and one tactic to start out.